Kornit’s HD systems, now comprising the Kornit Avalanche HD6, Kornit Avalanche HDK and Kornit Storm HD6, enable new levels of print quality, well suitable for the fashion and retail markets. Kornit’s NeoPigment Rapid ink, specifically developed for Kornit’s HD technology, offers an improved hand feel, as well as increased opacity and saturation of white ink. 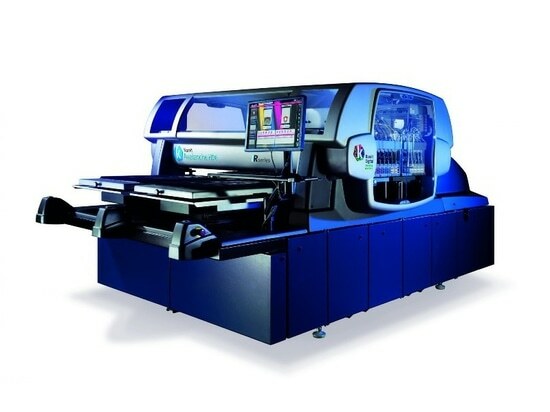 The print quality is further enhanced by ColorGATE’s Professional RIP solution, adding advanced color management and screening capabilities, improved white base creation and pre-defined color libraries for ultimate color matching. Jim George, CEO of Kornit’s long-term customer Trevco, called its HD investment a no-brainer: “In 2006, we decided to enter direct-to-garment printing and bought our first Kornit. Since then, we’ve expanded to 10 Kornit Avalanche 1000 systems. In February, we beta-tested the HD platform and were amazed at the increase in quality, especially within the red and green color spectrum.” George adds that the HD technology also dramatically improved their design resolution and hugely reduced ink usage by approximately 30%. “We immediately realized we had to apply this technology across our entire fleet. The HD platform finally allows us to have ad hoc ‘screen print quality’ design reproduction – a massive benefit to us, our customers and our licensors” George stresses. The proven track record of its heavy-duty, highly industrial Avalanche platform, brings Kornit to integrate the HD technology into the Storm platform which represents the mid-productivity segment of the company’s industrial direct-to-garment printing product range. The Kornit Storm HD6 includes six color channels (CMYK, Red, Green) plus white, for a wider gamut and improved spot color matching. Users can easily reproduce the true colors of licensed sports teams and accurately match corporate logos. The Kornit Storm HD6 will reduce the ink consumption by approximately 30% compared to the current Kornit Storm Hexa, meaning higher print quality at a lower cost per print.